People who routinely go target shooting are at increased risk for exposure to lead. When a gun is fired, lead dust and vapors are released and can be breathed in or settle on the skin, hair, or clothes. Lead has no biological role in the body, and no level of lead is known to be safe. Lead is especially harmful to children, and can contribute to learning disabilities or ADHD. It only takes a small amount of lead to raise a child’s blood lead level. Lead dust brought home from a shooting range on shoes or clothing can settle on floors, then be picked up on objects or a child’s hands, and from there taken to a child’s mouth. After going shooting, wash your hands, arms, and face to remove lead from your skin. Change your clothes when you get home and wash them separately. Keep down the amount of lead dust in the home through regular wet cleaning of floors. 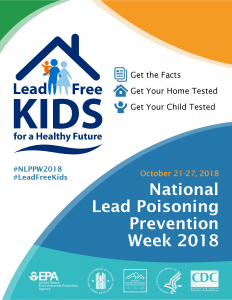 If you shoot regularly and have a child who is less than 6 years old, talk to your child’s doctor about lead poisoning and whether your child should be tested. For more information for indoor gun range owners, employees, and customers, please see our handout on Lead and Firing Ranges fact sheet. 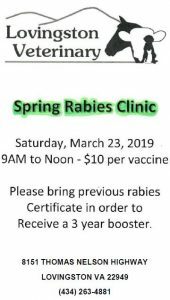 One of the best ways you can protect yourself and your animals is having your veterinarian vaccinate your pets for rabies and keeping their vaccinations up to date. Vaccinating domestic animals like dogs, cats and horses, creates a protective barrier between wildlife and humans. If we protect them, we protect ourselves. 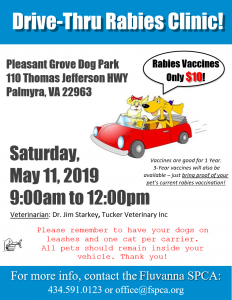 On Saturday, March 23, a rabies clinic will be held at Lovingston Veterinary Hospital and the Fluvanna SPCA will be sponsoring a rabies clinic for dogs and cats on Saturday, May 11. For more information, please see the flyers featured on this page. For information about rabies clinics that may be scheduled in your area, contact your local health department. A directory of local health departments can be found at http://www.vdh.virginia.gov/local-health-districts/. Kratom is an herbal extract made from the leaves of a tropical evergreen tree. It is sold as a herbal supplement in the United States. Kratom has some properties similar to opiates, but also can act as a mild stimulant. Some people take kratom to reduce opiate cravings or treat pain. Others take it recreationally, believing it helps improve mood. Why am I hearing so much about kratom lately? Kratom was first introduced into the US in the late 1990s and for years its use was very limited. In recent years kratom use has become much more common, possibly because of the opiate epidemic and people trying to use kratom to reduce their dependence on opiates. A new study on Poison Control Center calls related to kratom found they’ve become much more common in the past few years. In 2011 Poison Control Centers received 13 calls about kratom. This rose to 682 in 2017, and two-thirds of the 1807 kratom-related calls between 2011–2017 happened in 2016 and 2017. The sale of kratom is not regulated by the Federal Drug Administration (FDA), meaning the FDA does not inspect products to make sure they contain the ingredients they’re supposed to, the concentration of the active ingredients are correct, or that they are not contaminated. Because of this different products can differ in strength. People can overdose on kratom, and it can interact with other medications, alcohol, or recreational drugs in ways that can be dangerous. Kratom has been linked to 44 drug-associated deaths, mostly in combination with other drugs, but in a few cases kratom was the only drug used. Kratom can be addictive, and babies born to mothers who use kratom sometimes have to be treated for opiate withdrawal symptoms. Companies selling kratom don’t have to follow safe manufacturing regulations, and in 2018 there was an outbreak caused by Salmonella bacteria in kratom that made people sick in 41 states. Some states or localities have laws against the sale or possession of kratom. Currently, in February 2019, kratom is not regulated in Virginia, but it is illegal in Washington, D.C. There are currently no federal laws regulating kratom, although the FDA has used its authority to regulate dietary additives to restrict the import of kratom. Kratom is a drug and can have side effects that can be dangerous. Kratom causes loss of appetite, insomnia, tremors, and rapid heartbeat. People often report feeling itchy after taking it. It can cause nausea and vomiting. At high doses kratom can cause seizures. People who take kratom regularly can develop liver injury. I have been using kratom, what should I do? Talk to your doctor about why you’ve been using kratom and ask about alternative medications and possible side effects when quitting. Even if you don’t plan to stop taking kratom you should talk to your doctor about potential interactions with other medications or drugs or alcohol and the possibility of becoming dependent on kratom. Women who are pregnant, planning to become pregnant, or nursing should stop taking kratom to protect their baby from exposure. Like all drugs, kratom should be stored out of the reach of children. If you or someone else, especially a child, ingests kratom accidentally, call the Poison Control Center hotline at 1-800-222-1222. If the person is having severe side effects, call 911. Lead is a toxic metal that is still present in and around many homes in lead-based paint and urban soils. Lead can also be tracked in if parents have jobs or hobbies that expose them to lead. Children who are exposed to lead at a young age are at increased risk for speech delay, learning disabilities, and ADHD. A simple blood test can tell if your child has been exposed to lead. If you have children under six years old, ask your doctor if they might be at risk for lead poisoning. See the EPA’s home page on lead for more information. If you live in a home built before 1978 your home may contain lead paint. Use a damp rag to clean up any paint chips. Frequent wet cleaning will remove dust and dirt that could contain lead. Leave shoes by the door to avoid tracking in lead, and don’t let your child play in bare dirt around the house. If you do renovation projects, hire a contractor with RRP certification or follow guidelines for safe do-it-yourself renovation. 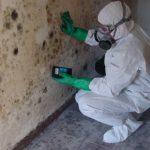 The cities of Richmond and Roanoke have obtained federal grants that will help pay to control lead hazards in private homes for qualifying homeowners. Residents of those cities who are interested should contact their local health department. 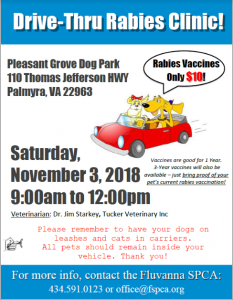 The Fluvanna SPCA will be sponsoring a rabies clinic for dogs and cats on Saturday, November 3rd. For more information, please see below. For information about rabies clinics that may be scheduled in your area, contact your local health department. A directory of local health departments can be found at http://www.vdh.virginia.gov/local-health-districts/. 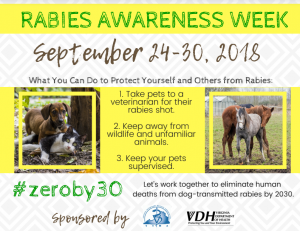 Rabies is a virus that is commonly found in Virginia’s wildlife, especially in certain wild animals such as raccoons, skunks and foxes. It’s important to remember though that any mammal can get rabies and that rabies kills almost any mammal that gets sick from it. 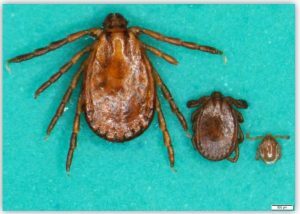 That’s why it’s important to take some basic precautions to help protect you and your pets from being infected. For more information about rabies visit http://www.vdh.virginia.gov/environmental-epidemiology/animal-contact-human-health/. Another great source of information about rabies is your neighborhood veterinarian. To find a veterinarian in your area, visit https://www.vvma.org/Find-a-Veterinarian.